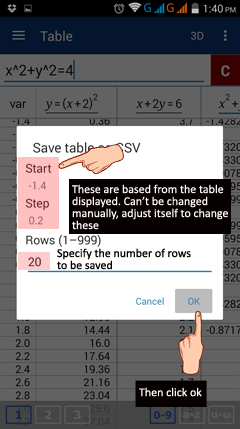 The table for a set of functions can be saved to the library, as text, or as a csv file. 1) Tap the options button in the top right corner of the table area. 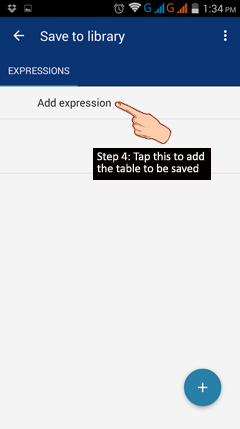 4) Tap add expression to save the table. 5) Add a file name under "Name" and a description of the table under "Description". 6) Tap the save icon next to the options button. 1) If you're not in Table Mode, tap the three lines in the top left corner to enter the Menu. 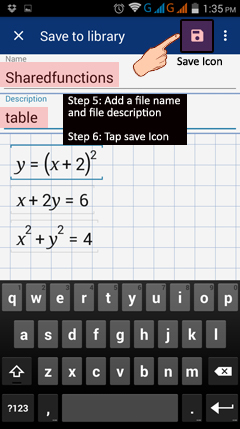 3) In the table window, tap the options button in the top right. 5) Tap Load from library. 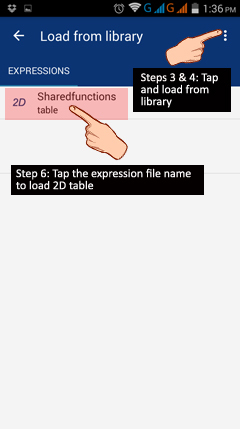 6) Under "Load from library" tap the name you used to save the table. 1) Tap the options button in the top right of Table Mode. 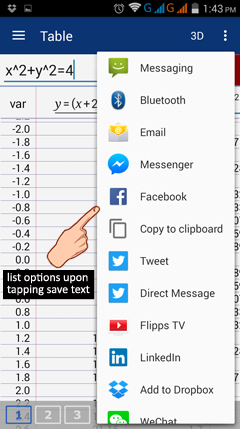 3) Tap Save as text. 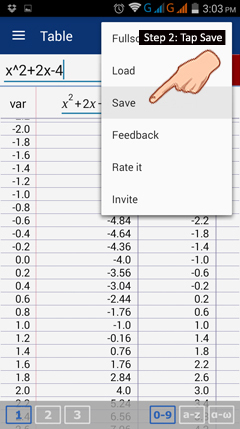 4) Tap the Interface (location) you want to use to save the table. 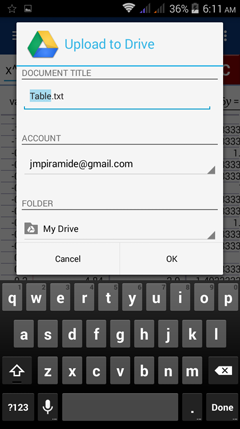 5) Add a file name/subject and send it to the desired location. 1) If you're not in Table Mode, go to the Menu by tapping the three lines in the top left. 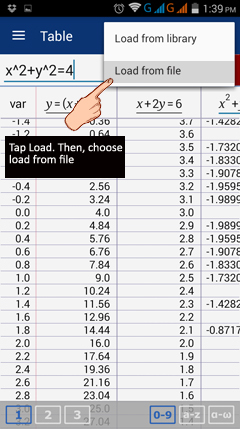 5) Tap Load from file. 6) From the list of options, choose the address/folder where you saved the table. 1) Tap the options button in the top right of the table area. 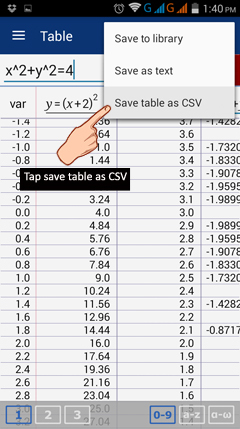 3) Tap Save as CSV. 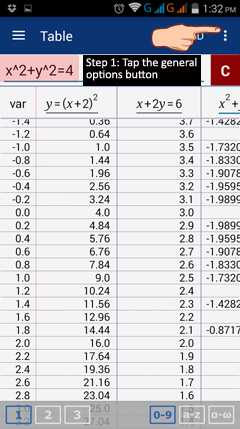 4) Specify the number of rows for the table of values (20 by default). The starting value in the row and the step size are displayed automatically. You can change these by going back to the table and adjusting it. 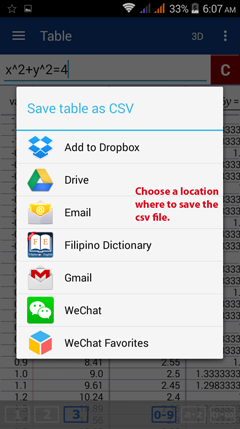 5) Choose a location (interface) where you want to save the csv file. Then tap add/save (depends on the interface). 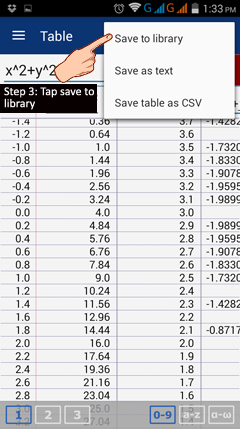 Any table saved as csv can be loaded back into Table Mode. 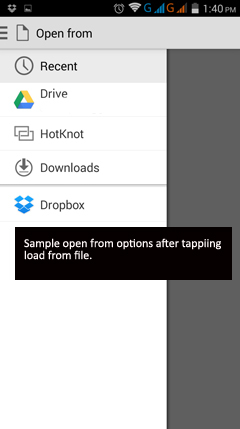 Follow the same steps to load a file saved as text.